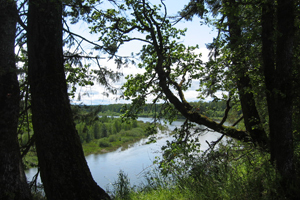 This 120-acre property, protected through a conservation easement in 2009, is perched high above the confluence of the Willamette, Luckiamute, and Santiam Rivers. With strong ecological and cultural resources on the property, Willamette Bluffs has an active restoration schedule to enhance and expand wetlands, woodlands, and prairies. This property is adjacent to a priority conservation area for streamside and upland prairie habitats and wetlands listed in the 2006 Oregon Wildlife Conservation Strategy. The confluence site has ecological value due to the complex terrestrial and aquatic habitats created by the convergence of the three rivers. Focal and priority species that might be expected to use this property include Western gray squirrel, bald eagle, Western meadowlark, Western bluebird, acorn woodpecker, Oregon vesper sparrow, Western pond turtle, and the red-legged frog. Along with nearby Luckiamute State Natural Area, Willamette Bluffs creates a conservation footprint of 1,035 acres at a key confluence site along the Willamette River. Partners that made the protection of Willamette Bluffs possible include the landowner, Ed Rust, and funder Bonneville Power Administration in partnership with the Oregon Department of Fish and Wildlife. Historic vegetation (1840-1870s) at Willamette Bluffs was primarily savanna and wet/upland prairies. From 1936 onward, the majority of the property was under agricultural production. Current cropland will be restored to native mixed woodland, upland prairie, and savanna habitats. Existing habitats will be enhanced by controlling invasive species and maintaining current wetland habitat. Willamette Bluffs can be accessed through GLT-led tours and events. No public access is allowed at this time.